PROVO, UT--(Marketwired - Apr 28, 2014) - Ancestry.com today released 11.5 million new records documenting one of the most prominent groups in American history, the "Religious Society of Friends," more commonly known as Quakers. Spanning over 300 years (late 1600s - late 1900s), the collection includes birth, marriage, death, disownment, and memorial records, sourced from the Quaker's monthly meeting minutes. Quakers have played a key role in American history and society since the country's earliest days. There are currently more than 85,000 Quakers living in the United States and 350,000 worldwide, but it is estimated that in the 1700s, 50 percent of all people living in the Mid-Atlantic States were Quaker. Ancestry.com has collaborated with a variety of institutions to compile a robust online documentation of the Quakers' history. With the help of American Quaker colleges Earlham, Haverford, Swarthmore and Guilford, and The National Archives in England, Ancestry.com estimates that it now has more than 75 percent of all the American Quaker records in existence. "I was raised in the Quaker religion, attended Quaker schools, and was married in a Quaker wedding ceremony. I feel a deep commitment to spreading awareness of their culture, beliefs and powerful influence in history," said Lisa Parry Arnold, a professional genealogist, author and lecturer at Ancestry.com. "These new collections will help people who are researching their family history discover or learn more about their own Quaker heritage." According to Arnold, Quakers tracked the activities of their members through their monthly business meetings. Detailed meeting minutes are part of the collection now available on Ancestry.com, and can provide important information for those researching their family history, including names, dates, and relationships to fellow "Friends." Monthly meetings also kept track of where members came from and their destinations when they chose to move to another colony, state or province -- a real boon for those tracing their ancestors' footsteps. 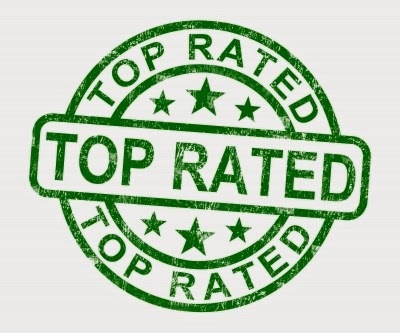 What are the top 5 websites you use most often for genealogy? This was a question posed by a friend on Facebook and I thought the responses were very interesting. They also gave me some leads on new avenues of research. So here is the question repeated and I hope my readers will comment with their top 5. The sites can be free or pay-to-view. Ancestry.com I use it daily for American, Canadian and British research and would be lost without it. It was difficult to narrow my top sites to 5 as I have about a dozen that I use frequently (meaning at least once a week). They include GenealogyBank.com, FindMyPast.com, OliveTreeGenealogy.com (yep I snuck my own site in this list but I do use it frequently), OurOntario.ca, TheShipsList.com and others. This is one of those feel-good stories we all love. And wouldn't we all love to find such a treasure? 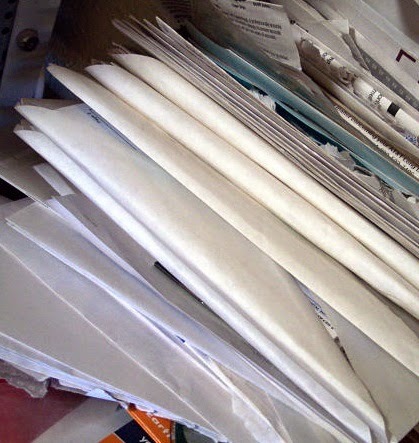 Joshua McKinney, of Casnovia, Michigan, was removing old insulation in his home's attic when he found a stack of old love letters from World War II. The letters and certificates (birth and marriage) he found all concerned the Kissel family. It didn't take long for Joshua and his sister to track down descendants and soon the granddaughter of the man who wrote the love letters contacted Joshua and retrieved all the letters and documents. This week's prompt is Telephones! That's right. Telephones and their use have changed greatly over the years. What kind of phone did you have in your home as a child? Did you have one phone in every room? Did you have to dial through the operator or did you have a rotary dial phone? Remember party lines? Maybe your family had one of those. We had one rotary dial phone in our kitchen. We kids didn't use it to call friends and chat. If we wanted to get together with a friend, we walked to their house and knocked on their door. Phones were for serious things - emergencies for the most part. Every Christmas my Grandmother would come to our home and my mom and dad would have a pre-arranged phone call to England so she could talk to her sister. Yep - pre-arranged. You couldn't just pick up the phone and dial England! You had to get the operator to set it all up ahead of time then you waited. The operator would ring you when your call was ready. I remember the excitement and anticipation of waiting in the living room while Grandma waited anxiously in the kitchen for the phone to ring. We all thought it was quite amazing that someone in Canada could talk to someone in England. It's so different now isnt' it? Click open Skype on your computer and have a video call with someone anywhere in the world. Text or Vox user Voxer PPT pretty much anywhere in the world on your cell phone. I love technology! Look what a very kind reader (Marsha W.) found for me! This is the story of what happened to my great-grandfather Stephen Peer the day he was attacked by an axe-wielding neighbour. Marsha read my story Sometimes the Best Find Comes When You Least Expect it! which had a brief condensed published version of Stephen Peer and Walter Hyde, then she found this more detailed version in a different newspaper. So now I have to wonder why on earth Great-Grandpa would not let Mr. Hyde pump water from the well. I'm guessing there was some kind of long-standing feud but it still seems extreme. 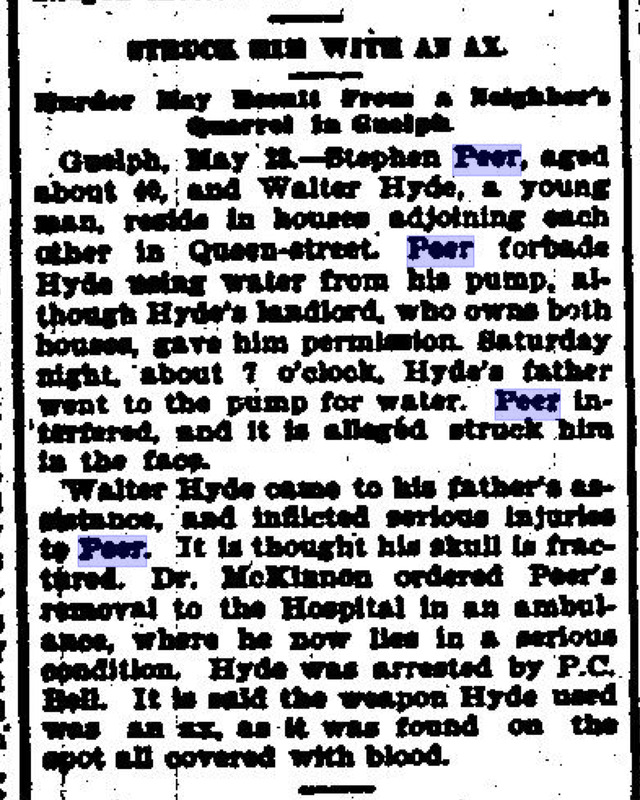 Now I want to find out how long Great-grandpa was hospitalized and whether or not Walter Hyde went to jail. Contrary to the article title "Murder May Result From a Neighbour's Quarrel in Guelph" my great-grandfather lived another two years. But he must have been quite seriously injured in this attack for such a headline. Another thing that interested me was the mention of Stephen being taken to the Hospital in an ambulance. This was 1895 and I'm wondering what an ambulance consisted of - a horse drawn covered wagon like this one in New York City in 1895? Now I'm curious about ambulances and what each community used in various decades. I think an email to the Guelph Civic Museum is in order. Perhaps they have some information or photos. Sometimes the Best Find Comes When You Least Expect it! About 25 years ago a woman I corresponded with about my PEER family in Guelph Ontario Canada told me an intriguing story. According to her she found a newspaper article about my great-grandfather Stephen Peer being attacked and killed by an axe-wielding neighbour. She didn't provide a date or any other details. No amount of pleading or coaxing on my part could get a source from her, not even the name of the newspaper. Stephen was not her ancestor and my Peer ancestry was of no interest to her so even my offers to share everything I had on the family held no interest. So for 25 years I've tried to find this reference. Some time ago I found Stephen's death registration for 1897 but the cause of death was listed as Typhoid Fever not murder. Nonetheless I checked Guelph newspapers for several months prior to his death just in case. But nothing turned up. These newspapers are not indexed so searching meant a long laborious read of every issue. Eventually I put this on the back burner as a curiousity, as a story that might have a little truth to it. A few days ago while searching through some online Ontario newspapers as I do periodically, I came across this extract of a larger story. It was published in The Lethbridge News (Alberta) on June 5, 1895 and was noted as a condensed story. I was pretty excited to find this but of course now I want the full story. Why was this pump so important? Who was Walter Hyde and his father? And why would an Alberta newspaper publish this? A search of Ancestry.com census records turned up some information on Walter Hyde. He was born ca 1874 to Alfred & Sarah (Farrow) Hyde. It struck me that Walter was quite a bit younger than my great-grandfather who was born ca 1853. I don't know if Walter went to jail or any other details of this incident but am determined to find out. Since getting to Guelph to hunt through the filmed newspapers is difficult for me I decided to hire the Guelph Public Library Research Services to look for any references to this event. Fingers crossed that I find out exactly what happened. Of course if any of my readers live in Guelph Ontario and would be willing to have a look in the Guelph Mercury in first week of June 1895 for this story, please let me know! The moral of my story is NEVER GIVE UP! Okay I have two morals - never give up and never ever dismiss a "story" as untrue until you've found evidence to either prove or disprove it. Here is a corrected list of contents for film 1150. A 2 year old child, thought to be lost when the Titanic sank, is at the crux of this story. Lorraine Allison and her parents were all reported as dead but only her father's body was ever recovered. Years later a woman named Helen Kramer came forward claiming to be Lorraine and stating she had been rescued but no one knew who she was. The Allisons were a wealthy Canadian family and refused to accept that Helen was Lorraine, believing it was a hoax to obtain money. Helen and her family waged a long war to be accepted by the Allison family. In the end DNA evidence revealed the truth - that she was not Lorraine. However the years of insisting she was indeed Lorraine resulted in a great deal of drama including restraining orders imposed by the Allison family. This story intrigued me so I did a little research on the family. Hudson Allison, Lorraine's father is found in the 1901 census living in Chesterville Ontario, which happens to be where the Allison family burial ground is located. Hudson was born in 1881 in Winchester Township, Dundas County Ontario. 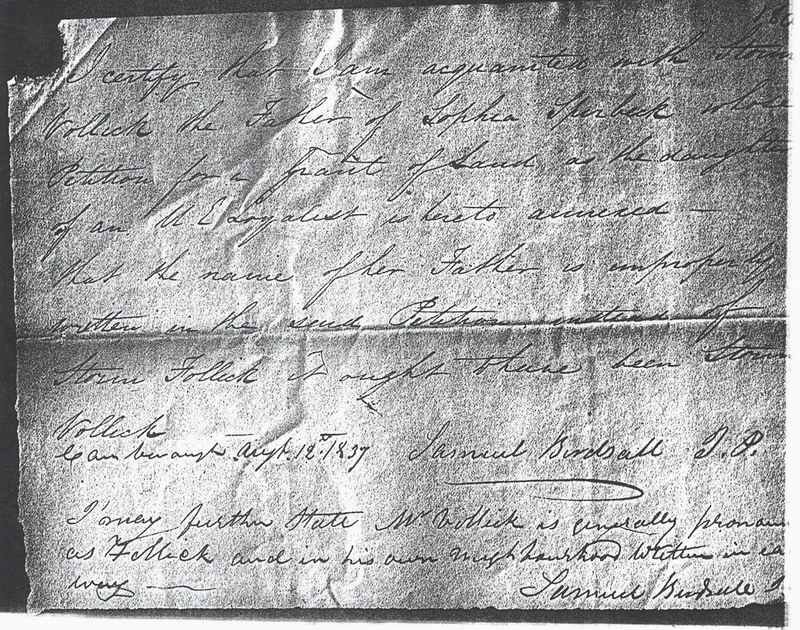 His birth registration found on Ancestry.com shows him given the name Hudson Joshua Creighton Allison by his parents Jessie R. Allison and Phebe [sic] Johnston. October 1909 saw the family of Hudson, wife Bessie and daughter Helen Lorraine sail from Montreal to England on board The Megantic. Hudson appears to have been a frequent traveler, no doubt for his business as he also appears on the passenger list for the Campania sailing from Liverpool England to New York in April 1911. In fact the 1911 census for England shows him staying at the Carlton Hotel in London. He is listed as a 30 year old Financial Broker. He also appears in the 1911 Census for Canada with his wife Bessie, 24, born in Wisconsin and his two children Lorraine 2 and baby Hudson 5 months old. Further research shows that his wife Bessie was born in Wisconsin to Arville and Sarah Daniels. 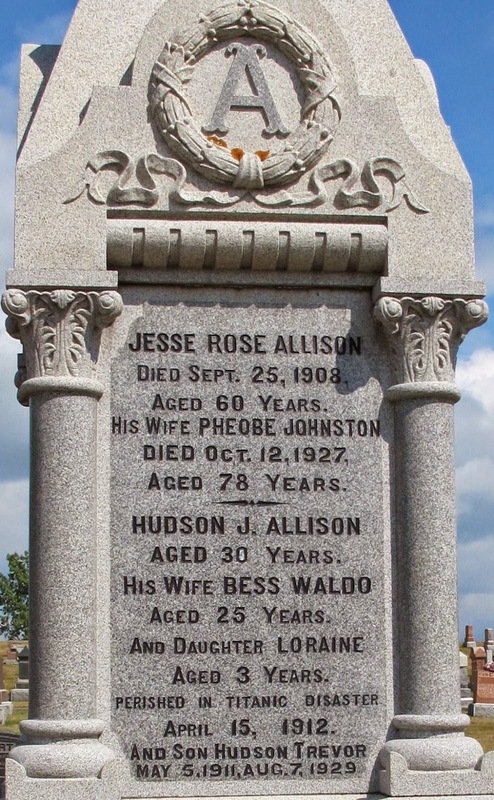 The Allison family memorial is found in Chesterille Ontario and shows that baby Hudson was rescued but died at the age of 18. "Ocean Park, Aug 8 -- Hudson Trevor Ellison [sic] age 18, of Westmount, P.Q, who had been passing a vacation with his aunt and uncle, Mr. and Mrs. Hudson Ellsion[sic] on Seaside Avenue, died Thursday after a short illness as the result of ptomaine poisoning. The body was taken during the day to Chesterville, P.Q for burial." know that I had hear rumours that E.B. was on Twitter. Well I'm happy to say I found him yesterday! 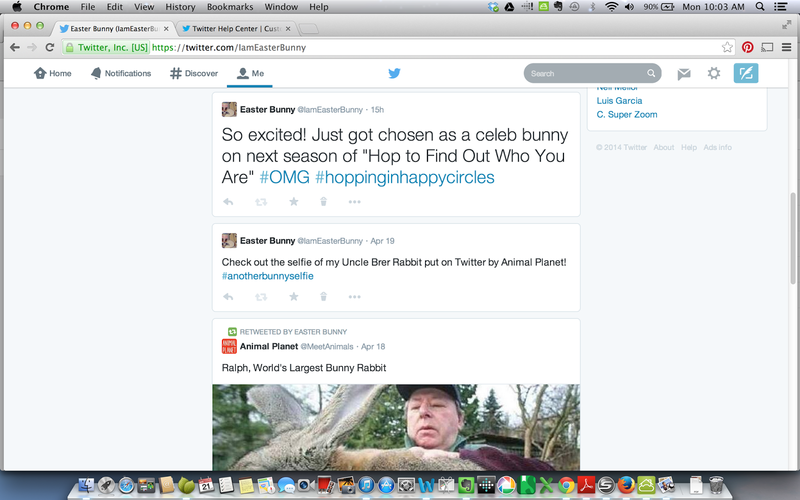 His Twitter handle is @IamEasterBunny if you want to see what he's been up to. 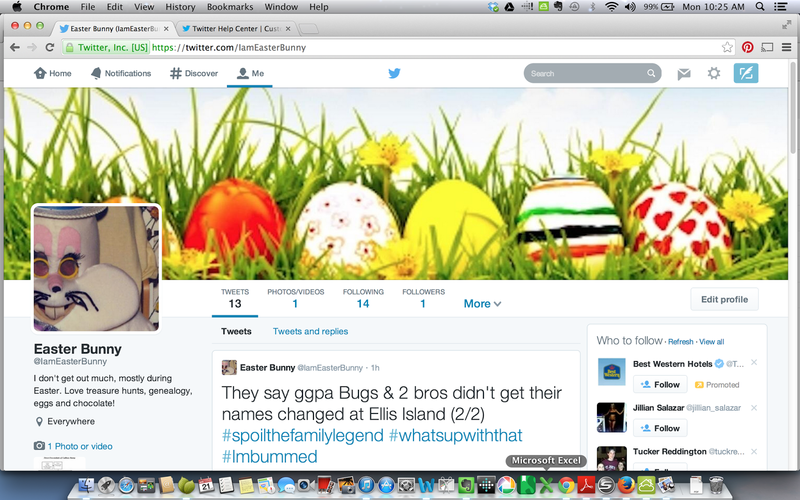 I read his tweets (See below for images) and it looks like he's hot on the bunny trail of a few of his brick walls. Plus he announced yesterday that he's been chosen as a Celebrity Bunny on the next season of the TV show "Hop to Find Out Who You Think You Are" Wow I can't wait to watch that episode! This week's prompt is Memories of Grades 10 and 11. I have no memory of Grade 10. None. My theory of this blank spot in my memory is that it's due to my dad's sudden death on Christmas Day of Grade 9. Because it's as if Grade 10 didn't exist for me. 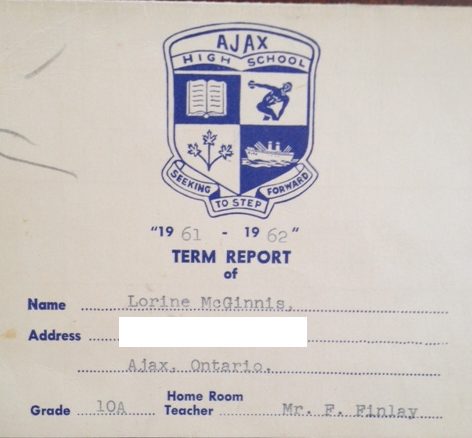 Grade 11 is a bit of a blur but I remember having to get up in front of my class and read an essay I'd written. I was shaking so badly I could hardly see the words on the papers in my hand! I think my teacher thought I was going to burst into tears because he didn't make me finish reading it. I was pretty shy back then and didn't really fit in with the rest of the kids, both socially, economically and in fashion. But no one every picked on me or bullied me. In fact I experienced the opposite - the other kids looked out for me and were very kind to me always. I had tons of friends which doesn't really fit either with my shyness and the horrible clothes I had to wear and where I lived in town. You'd expect me to be ignored or ostracized given the circumstances. But I wasn't and in fact I actually got invited to a few parties in the "new area" of town. When I was a teenager the old and new area kids did not mix as a general rule. But the majority of my friends were new area kids and we all hung out at my house constantly. That was one unwritten rule the new area kids never broke - I was never invited to their homes except for the occasional party. Bottom line was that I loved school and I had tons of friends so in that area of my life I was very happy. What are your memories of those High School years? This was announced previously on Olive Tree Genealogy blog but I felt it was worth repeating! Breaking news - yesterday a little girl named Alice was playing in the garden of an old house in England when she fell down a large rabbit hole. Before climbing out she made a unique discovery. In a small wooden box under a pile of rabbit fur hats Alice spotted a yellowed letter. The letter was addressed to "Dear Easter" and signed "Uncle Wiggily", and it provided details of an interesting family tree! I'm glad you asked about your family. Time is getting short for me and I think I'm the only one left who knows the stories of our family. Your great-grandfather, Bugs, was one of three brothers (Bugs, Peter and Brer). The brothers left their home and sailed for America in the late 1800s. The ship they were on was caught up in a terrible storm and the brothers had to tie themselves to the mast. The ship sank but Bugs, Peter and Brer were lucky enough to find a plank and they climbed up on it and drifted for several days until they were rescued by the SS Lollipop. When they got to Ellis Island, the customs officials changed the brothers' last names before allowing them to leave the ship, and so the three branches of our family began. Bugs, Your great-grandpa, kept his Bunny name. Peter's was changed to Cottontail and all his descendants have kept that name. Brer's name was changed to Rabbit and it is from his line that our famous cousins White and Velveteen descend. Great grandpa Bugs later met and married your great-grandmother Bunny Fufu. I don't know anything about her parents. My cousin Willy Bunny has photos and her family bible but he is stingy with the family information and refuses to share. Apparently Bunny Fufu's family bible was tossed into a fire by Indians when they attacked the settlement where she and her parents lived, but Bunny's father leapt into the flames and saved the bible. I wish Willy would not be so secretive with the information! It gets a bit confusing, but Velveteen Rabbit, your mother, was your father Energizer's second wife and his third cousin once removed. It wasn't unusual for cousins to marry each other, but it does get confusing as we all seem to have large families. Velveteen's father (your maternal grandfather) was Peter but I don't know too much about your mom's side of the family. I did hear there was an Angora in there somewhere way back. Some say she was a Princess and Peter rescued her from pirates! Of course you know your grandparents - Buster and Trix. One day you should ask your grandma Trix why she calls your grandpa Buster by his nickname "Hassenfeffer" whenever she is mad at him, it's a cute story. I've done some research on our family but am stuck on your great-great-grandmother. That would be your Great-Grandpa Bugs' mother. Great-Grandpa Bugs' father (your great-great-grandpa) was named Cadbury but I think your great-great-grandma was left by aliens. She is my brick wall. I know Cadbury called her Flopsy and they had 54 children but even though I've searched everywhere, I can't find what her SIRname was. Well Easter, I think I've given you enough details to confuse you, but I hope I've gotten you interested in learning more! I know where some of the graves are of your ancestors and will take you there one day if you want to go. It's just a hop, skip and jump away. In 2011 Easter was delighted to discover a Family Bible that once belonged to his great-grandmother Bunny Fufu! He's been hunting ever since, tracking down leads on the Bunny Trail and exploring every nook and cranny he can find. UPDATE! I have learned that Easter opened a Twitter account last year and I'm trying to ferret that out so I can publish his tweets here as an exclusive Olive Tree Genealogy blog post on Monday. The following is a list of digitized microfilms that have been recently added to the Héritage website. Please note that although the titles have been translated, the records are still in the language of origin. To remember the commencement of the Civil War in April 1861, FOLD 3 invites you to explore all records in its Civil War Collection for free April 14–30. The latest trick I've found is an amazing time-saver and one I touched on briefly in my last blog post More Ways to Use Evernote to Create Virtual Genealogy Binders. Now I've fine-tuned this method and want to share it with you. It has saved me so much time and duplication. This is the method where instead of creating a new note in your Evernote Binder and methodically importing one file at a time by using the FILES>ATTACH FILES command in Evernote, you accomplish this in a different more efficient way by importing files as batches directly from your computer drive. First step is to make sure your computer files are named correctly. I've discovered that if you name your genealogy file (either image or document) with the exact name you want to use as the Title of your note in an Evernote Binder, this file name is imported as the Title of the note. 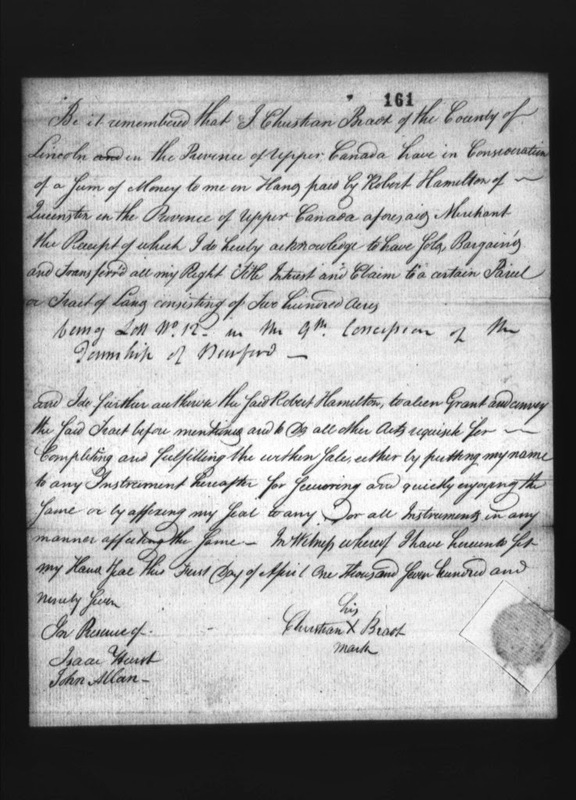 So if you import a file named "jacobdewhirst1820baptism.jpg" the title will be automatically inserted as "jacobdewhirst1820baptism"
Instead of having to rename it in the note to "Dewhirst Jacob 1820 baptism Yorkshire England", make sure your file on your computer hard drive has the name you want in the Evernote note so that you do not have to redo anything. Previously I titled my notes in my virtual Genealogy Binders with the year then the person's name then a description. But since Evernote limits how many Binders you can create,I soon realized I needed to put all the siblings of my direct ancestors in the same binder. I can't create one binder for each person. So I needed to rename my notes with the surname then the first name then the year, followed by the description. That way each individual's notes will be grouped together and in chronological arrangement. It is easy for me to make sure my computer files follow this format. 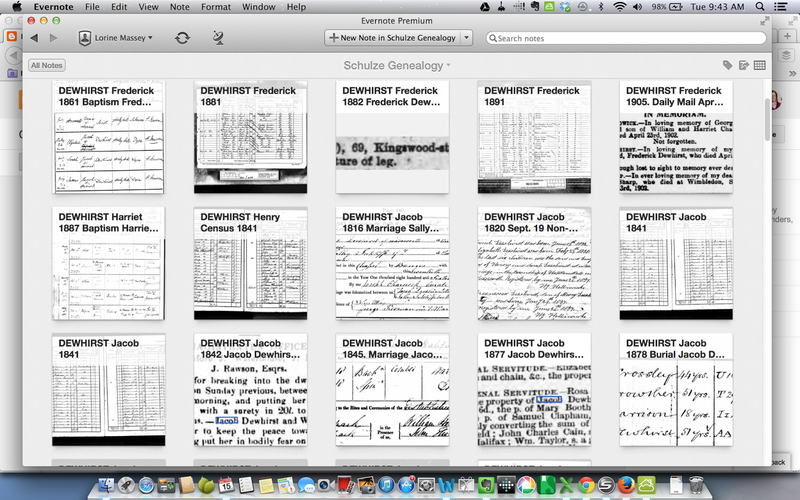 For example as I am searching on Ancestry.com and saving various records for Jacob Dewhirst and family, I rename each file as it is downloaded. The 1841 census for Jacob gets the name "Dewhirst Jacob 1841 Census Yorkshire England" His baptism record gets the file name "Dewhirst Jacob 1820 Baptism Yorkshire England"
The next time-saving step is to go to my computer folder where the files are for Jacob Dewhirst. I can highlight them all, right click and choose "ADD TO EVERNOTE". 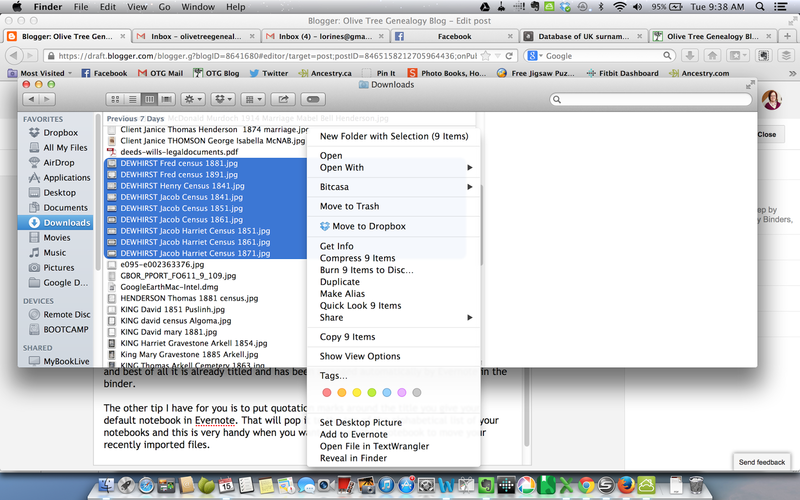 Every file I've highlighted pops into my default notebook in Evernote. Now it is very easy to open that default notebook, highlight all the newly imported files (they will all be together because of how I named them), right click and choose "MOVE TO NOTEBOOK Schulze Genealogy"
Every image and document I imported is now very nicely in place in the correct notebook and best of all it is already titled and has been arranged automatically by Evernote in the binder. The other tip I have for you is to put quotation marks around the title you give your default notebook in Evernote. That will pop it to the top of the alphabetical list of your notebooks and this is very handy when you want to open that notebook to move your recently imported files. This is a fascinating story of an amazing find in an attic. 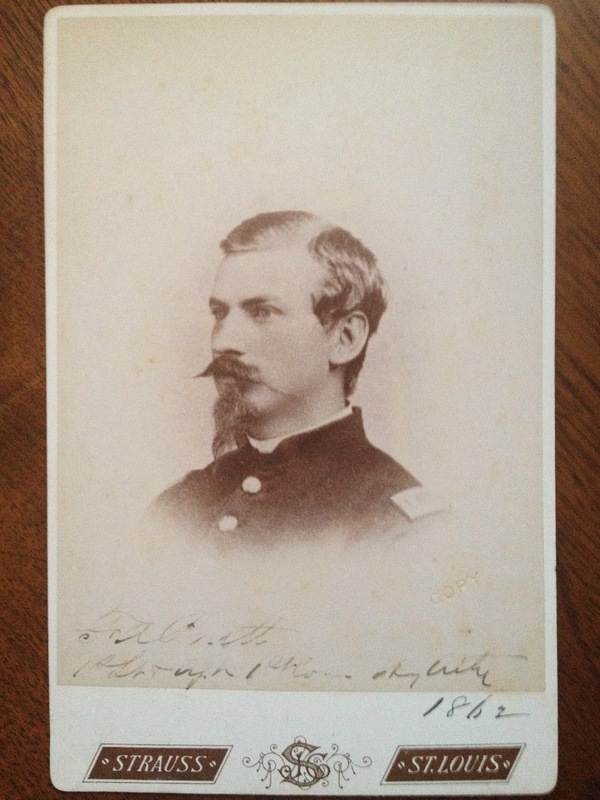 Hundreds of photos from the Civil War were found in a house belonging to one of the descendants of Alfred Waud, the Civil War artist. They were purchased by one man who carefully inventoried each photograph and stored them in archival sleeves. In the end the collection consisted of over 500 albumen prints from the Civil War and the American west. This week's prompt is "A Special Song", a song you loved as a teenager. What music was popular when you were young? What did your parents listen to? What bands or groups did you ooh and aww over? We didn't have a radio or record player until I was about 9 or 10 years old as my mother always wrinkled her nose in disgust when she heard music and would emphatically state to anyone who would listen, "I hate music!" After my father bought a player, he got several 33LP records (remember those?) of musical show such as Oklahoma and South Pacific. I soon learned all the songs and my favourite was "Happy Talk" from South Pacific. Dad also had lots of Irish crooners and an album by George Formby which he listened to constantly. I loved the song on that album "Does your Chewing Gum Lose its Flavour.."
When I was 10 I chose to have my own record player rather than the bicycle which was tradition in our family. At the age of 10 each of my siblings got a bike but I wanted to be able to listen to music. My mother was shocked but she begrudgingly went along with my choice. I was so thrilled when my little plastic record player with plastic records arrived! My bedroom became my haven and I'd sit and play my records over and over. I was a teen in the 60s so of course The Beatles were a huge impact then! But I have to be honest and say I preferred The Rolling Stones.When I was a young teen I started off listening to folk music - Ian and Sylvia, The Mamas and Papas, and other similar groups but it didn't take long before I was heavily into The Stones, Jefferson Airplane, The Animals, The Doors and other "edgier" groups. 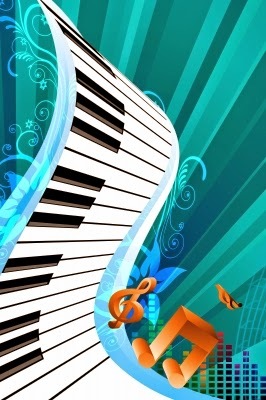 I still love music and even though I'm a "senior" I try to keep up with what's new and what's happening in the music world. The gals where I get my hair done chuckle over my iTunes songs in my playlist as it's quite a mixture of songs by such artists as Shinedown, One Republic, Dashboard Confessional, Adele, Ed Kowalczyk, Pit Bull, Walk off the Earth, Flo Rida, Hedley, Hawksley Workman, The Killers, Jazmine Sullivan, Lady GaGa, Elton John, Maroon 5, Mary J. Blige, Pink Floyd, Radiohead, Santana, Shawn Mullins, Sting, TIna Turner, Sublime, Velvet Revolver, Melissa Etheridge, Green Day and many more. 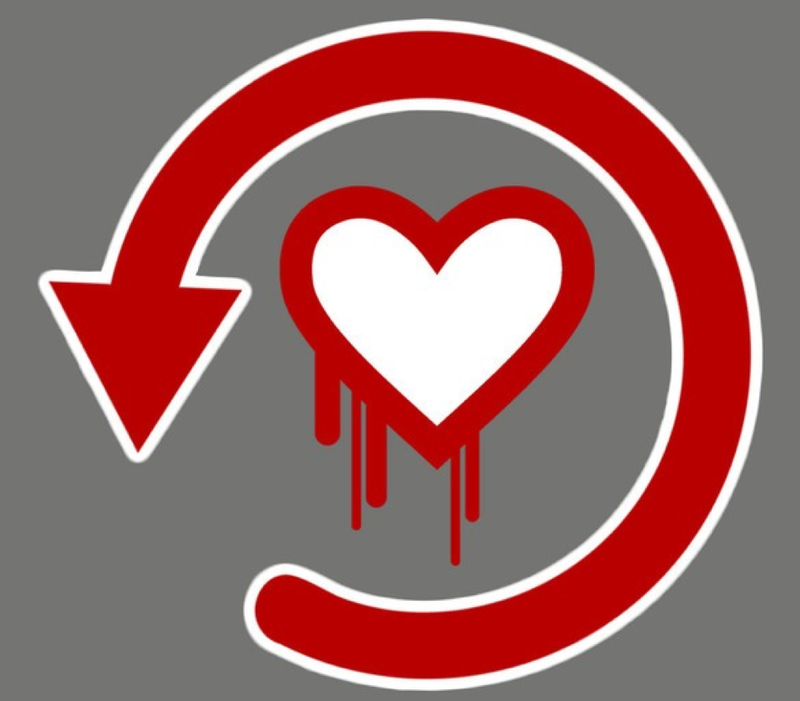 Unless you've been living under a rock you have no doubt heard about the Heartbleed Bug. Basically it's a bug (a glitch) in the encryption used by many big companies such as Facebook and Dropbox. No doubt you do use some of the companies who may have been afffected or at risk. That means we all need to change our passwords once a site has given the thumbs up that they've patched the security risk. To make your life easier, here is a link to Mashable's list of sites that have recommended user passwords be changed. It is updated daily so check it often to see if new sites have been added. If you do not live in the United States you won't find the list of banks and government sites much help. For those you will have to visit your country's specific bank and government agency sites to see if you need to take precautions. When you go to change your password, please create a strong password. It should be a mix of characters, numbers and letters and it should be random. Don't use your pet's name or your child's date of birth. Don't use your mother's maiden name. Don't use a recognizable sentence or phrase such as "thecheshirecat" or "thequickbrownfoxjumpedoverthelazydog" Even changing some of the letters such as a and e to characters is useless against the amazing fast tools hackers have to crack passwords. Here's a list of the top 500 worst passwords. Make sure your password isn't on this list! And please do not use the "trick" of creating a base password and altering it slightly for different websites. That's not a good idea even though many are touting it as a way to remember all the passwords we need to keep. Because of course you are not using the same password for every site, are you? I hope not! You must have a unique password for each site or you are at risk. If you use one password for all, and then Site A is hacked the hacker now has access to all sites you frequent. If like me you have dozens of passwords for all the services you use, you must either use a password Manager such as Dashlane or LastPass, or you must write them down and keep them in a secure (preferably locked) spot in your home. Obviously I can't share specific secrets with you of the ways I manage or store my passwords but I can tell you that for the dozen passwords I must take with me on the road, I use a code to disguise the actual password. In other words, the password is there but the name of the site to which it refers is not noted in any way a person would understand. As well the actual password is coded so that only I know what certain letters and characters mean. Some mean I remove them from the password. Some mean I capitalize the letter. Some mean I substitute a specific character. Yep I know, it sounds like a spy novel. But my motto is "Better Safe than Sorry". With all the hacking going on these days and with the incredibly fast ways hackers have to break passwords, I take no chances. Don't wait. Change your passwords when each site has fixed or patched the security flaw. My 5th great-grandfather Isaac Vollick, born 1732 in Schoharie, New York, was a United Empire Loyalist who came to Upper Canada from the United States during the American Revolution. He was the illegitimate son and only child of Isaac VanValkenburg and Maria Bradt. Although no record of a marriage has been found for Isaac and Maria, their son Isaac used his father's surname until 1782. During his years as a private in Butler's Rangers, Isaac's surname changed from Van Valkenburg, meaning in Dutch, 'from the castle of the falcons' (van=from; valken=falcons; burgh=castle), to Valk or Valck which means 'falcon'. It appears that Valk was his nickname and on being recorded by English clerks, a vowel was inserted between the final 'l' and 'k' making the surname Valic or Volick. Over the years, the surname was written as Vollick, Volic, Valic, Valck, Valk, Volk and Follick (the German/Dutch accent making a 'v' sound like 'f' to English ears). 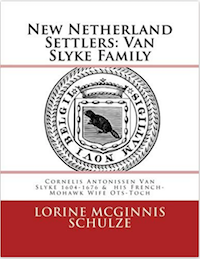 My line, descended from his son Cornelius, took the Vollick surname. His son Storm used the Follick surname. In the next generation some Follick descendants used Vollick while some Vollick descendants used Follick. It makes it interesting trying to research all branches of this family! Evidence of a French colonial home in St. Louis was found beneath layers of concrete and bricks during digging by the Department of Transportation. It is the first trace of Colonial St. Louis, Missouri which was thought to be completely destroyed by later building. Archealogists and historians have confirmed that the house which was constructed of vertical logs rather than horizontal, was built in 1769 by Joseph Bouchard, then later owned by Philip Riviére. 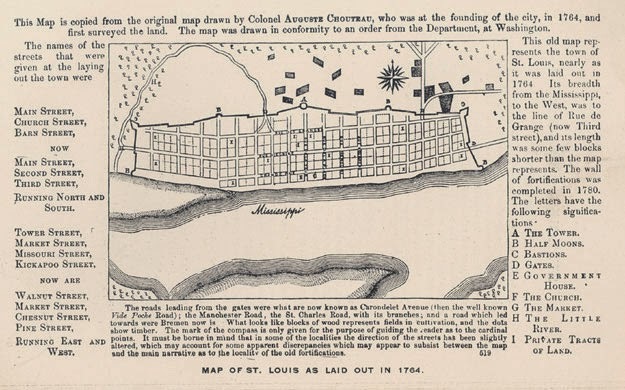 The history of the early settlement of St. Louis is a fascinating story. It began as a fur trading post in 1764 so this newly excavated log home is one of the very earliest. 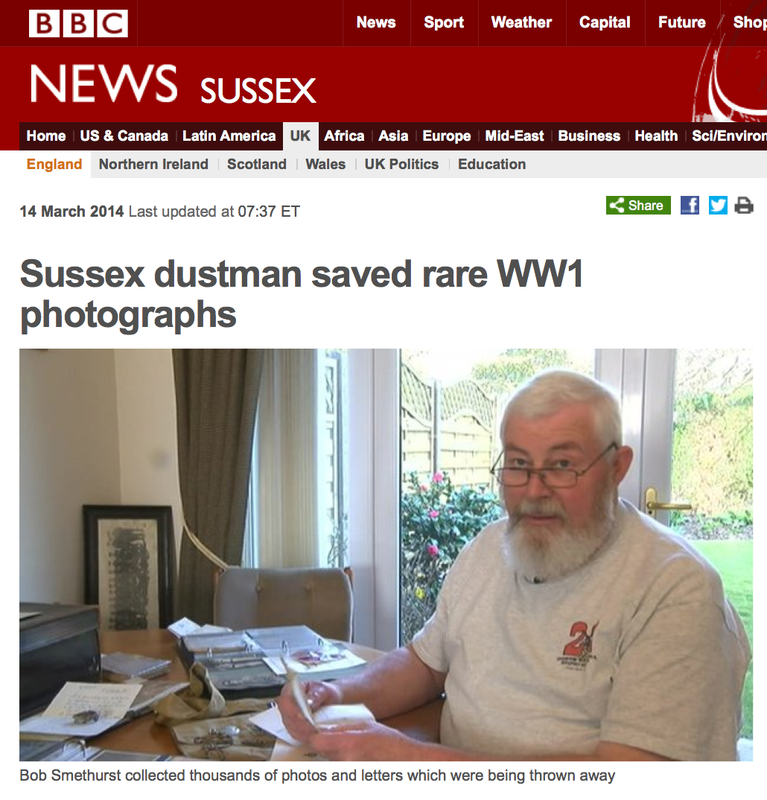 This is a fascinating story about an ordinary man in England who took it on himself to save and preserve WW1 photos, cards, letters and other objects from the dump. Bob Smethurst worked at collecting garbage for decades. In the early days there were garbage pails that had to be dumped into the trucks. As these pails were dumped, papers and photos were easily spotted. Not wanting some of the lovely photos of soldiers and WW1 postcards he saw to be lost forever, Smethurst began saving them. Little did he know that he would end up with over 5000 photographs and letters, some of them very rare. Mr. Smethurst defines himself as a custodian of these documents and is making plans on what should happen to the collection. This is a fascinating story and how I would love to visit Mr. Smethurst and look through is amazing collection. Good news for those seeking to prove an ancestor for admittance to DAR (Daughters of the American Revolution). Keeping up with the times, DAR now accepts DNA as evidence to support a claim of descent from a Patriot ancestor. 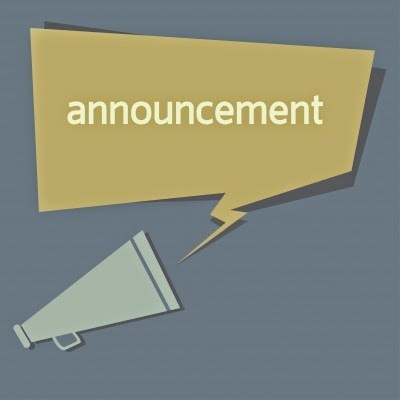 "The DAR accepts Y-DNA evidence in support of new member applications and supplemental applications. Y-DNA evidence submitted along with other documentation will be considered along with all of the other source documentation provided to prove heritage. 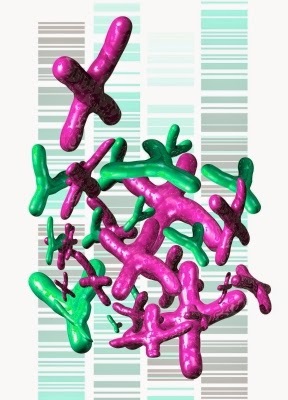 Y-DNA will not be considered as stand-alone proof of lineage because while it can be used as a tool point to a family, it cannot be used as absolute proof for an individual." Full details of criteria can be found at the DAR website above. As a followup to my last post on using Evernote to create virtual Genealogy Binders I have continued playing with organizing my genealogy files using Evernote. There are a few more features I've discovered along the way which I want to share with my readers. First, a caveat - be careful using the "Merge" feature! Once you merge notes, this action cannot be undone. Supposedly you can retrieve the original notes from your Trash and restore them to Evernote as individual notes but I am using a Mac and the notes I accidentally merged are not in my Trash. UPDATE! I found the trashed notes. They are not in the computer Trash bin but in the Evernote Trash. If you choose to view all notebooks, the Trash bin is displayed and opening it will show you the original notes. You can easily restore them to your binder or notebook so that you don't have to redo them. Merging notes is something I do want to play with as I can choose PRINT in Evernote and then save the merged notes as a PDF file. That would allow me to more easily share or print the merged file for a hardcopy binder if I choose to do so. Next, a nice little feature I discovered this morning is a much easier way to insert notes into a binder (notebook). 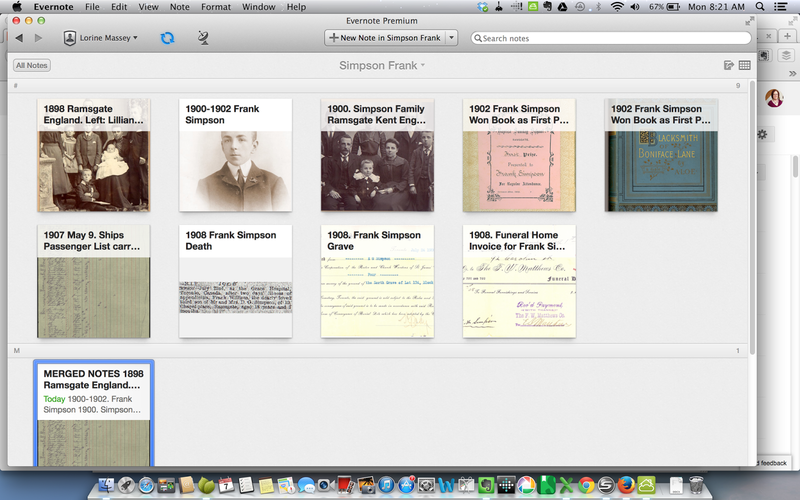 I have been creating a notebook (Frank Simpson) then within Evernote choosing the option "New Note in Frank Simpson". An empty note window opens and I then select "File>Attach Files" and search for whatever picture or document I wish to add. Then I give the new note a title and it's done. This morning I found that I could do this in a different way. I open my Finder window (in a Windows computer that is the same as Explore) which shows all the folders and files on my computer. 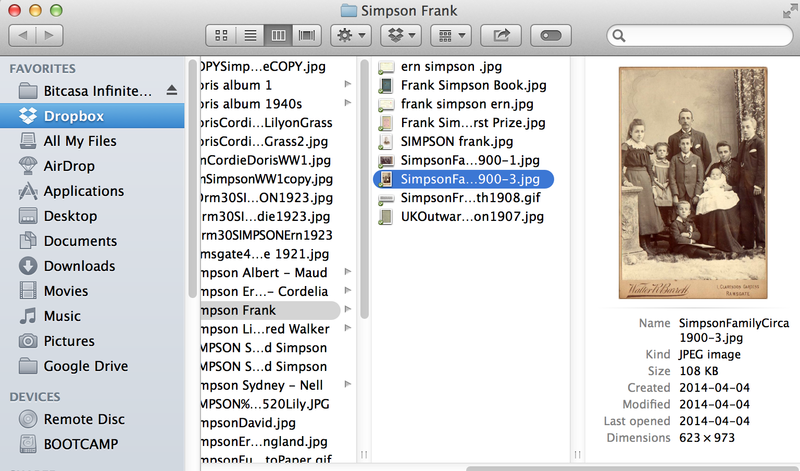 I go to where I know I have photos and docs for Frank Simpson. Yes I actually have some of my genealogy files organized so that I can choose a folder which contains all the documents and photos I have for an individual. Once I see the files for Frank I select the first one, right click and choose "Add to Evernote". 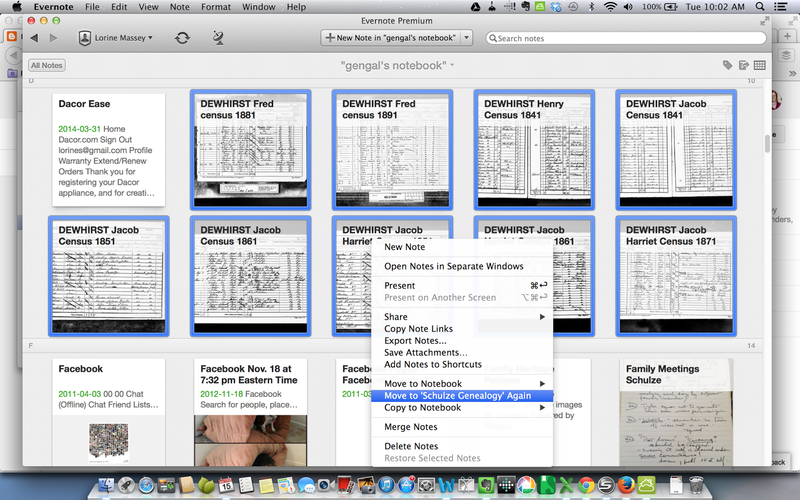 The photo or document pops up in my default Evernote Notebook. It isn't in Frank's notebook but that's okay. I rename the note using the year as the first word in the title. I could also rename each note with surname then first name then description. Whatever I use as my renaming convention it needs to be consistent. I continue sending all the photos and documents to Evernote. They are all in my default notebook. Now I make sure I am in that notebook and choose View>Expanded Card View. That pops up all the notes in that default notebook and because I have chosen alphabetical order for my notes, I can easily see all the notes I just added for Frank. Next I highlight all the notes for Frank, right click and choose "Move to Notebook...." There is a small arrow which allows you to choose the notebook you want for those notes. I choose SIMPSON FRANK and bingo, all the notes I inserted from my hard drive are now in Frank's virtual binder. 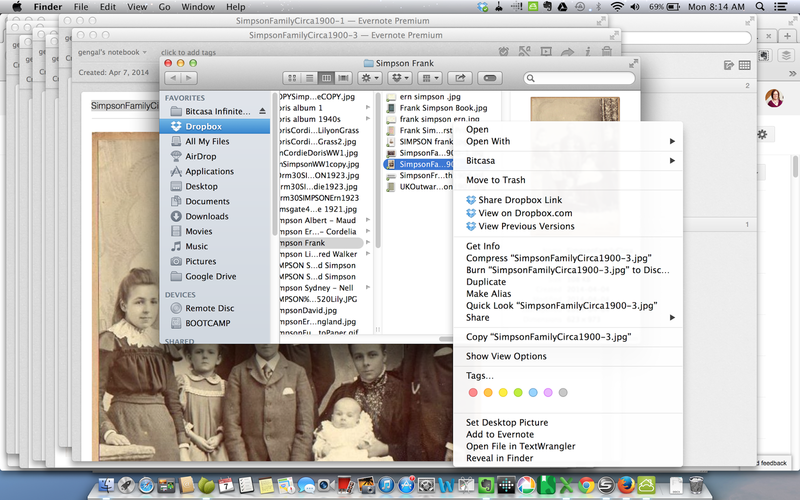 This method appeals to me as a more efficient way for me to put all my genealogy photos and documents into Evernote. Some of you might be asking "Who is this Frank Simpson?" Well he was my grandmother's younger brother. He came to Canada from England at the age of 15 to live with his older brother, but sadly died of appendicitis in Toronto in 1908 shortly before his 19th birthday. My grandmother often spoke of him and how much she missed him. I have the book he won at the age of 12 which is inscribed to him, and also the receipt for his funeral and burial plot so I feel very connected to him. Sharing Memories Week 14: Grade 9 - Love it or Hate it? This week's prompt is "Grade 9". Did you love it or hate it? Did you walk to High School or take a bus? How did you feel going into Grade 9 - were you scared or excited? We had Initiation Day in my High School. It was horrible. We Grade niners had to dress as Romans in old bedsheets to look like togas. We had to fashion crowns of ivy to wear on our hands too. We were slaves for the day and had to carry books for several students at once. We had to use our noses to roll marbles up the cement incline to the front door of the school and at lunch time we had to kneel on the floor under the lunch tables so the older students could use our backs as a foot rest. The worst was the shaving creme they squirted into our faces and mouths. Initiation lasted the entire day and it really wasn't any fun at all. I had my photo taken and put in the local paper while I was rushing down the hallway. Grade 9 was a bit of a blur for me. My father died that year on Christmas Day so from January on I really don't remember much of what went on in school. I was very shy and it was all my teachers could do to get a word out of me. My favourite teacher was Mr. Parrott. He taught English and I thought he was wonderful. He took an interest and tried to coax me to answer questions in class. He told my mother that I knew the answers but wouldn't put my hand up to volunteer them. Eventually he was able to get me to come out of my shell and start enjoying and participating in class. I loved taking part in all of these activities but then my mother said I had to get an after-school and weekend job. The extra-curricular went out the window as I could not do both. I worked at our local library every day after school (4 pm - 6 pm), two evenings a week (7pm - 9pm) and all day Saturday. It wasn't easy to keep up with my school work and get good grades with all the hours spent working but somehow I managed. But I sure missed my after school activities.